James Tartaglia is Senior Lecturer in Philosophy at Keele University, and the author of various works in metaphysics and the philosophy of mind; his latest book is Philosophy in a Meaningless Life: A System of Nihilism, Consciousness and Reality (Bloomsbury 2016). 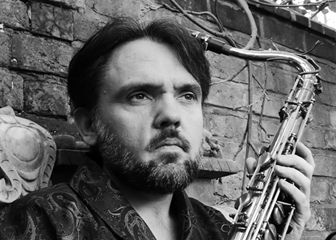 He is also a jazz saxophonist and composer, who was the winner in the soloist category of the Daily Telegraph Young Jazz Musician of the Year competition in 1991, and later received a major scholarship to Berklee College of Music, USA, where he studied saxophone with George Garzone; he has since played at venues and festivals throughout the UK. Jazz-Philosophy Fusion, his own conception, is designed to express the emotional significance of philosophical ideas, and thereby provide new inspiration to jazz music. He has explored this concept on three previous albums (A Free Jazz Treatise, 2002; Dark Metaphysic, 2008; Kooky Steps, 2014), but Continuum of Selves will be the first full-scale and dedicated work. The project has been made possible by his receiving the APRA Research Foundation Berlin Multidisciplinary Fellowship for 2015. Find out more about James here.